America’s involvement in World War II saw enlistments in unprecedented numbers in various branches of the U.S. Armed Services. There were new opportunities for women, as it became apparent that the military could free up more men to fight worldwide. Over 400,000 women enlisted to serve in America, Europe, and Asia as ambulance drivers, pilots, aircraft mechanics, nurses, and other non-traditional roles. More than 400 women lost their lives, while 88 were captured and held as prisoners of war. This photograph comes from the World War II service of Mary “Brockie” Daniles of Manteo, N.C. Mary Brockwell “Brockie” Danie ls (1912-2007) was born in Manteo, North Carolina to Edward and Mary Wescott Daniels. She was n the Women’s Air Corps in both the United states and Europe during World War II. During the war, she was sent to Paris, France, as a member of the 29th Traffic Regulating Group. This group was responsible for controlling and regulating traffic in the Military Railway Service, in Marine Operations, and Motor Transport throughout the European Theatre for the Allied forces. After the war, Daniels remained in the one of five children. Daniels received her BA in English in 1935 from the Women’s College of the University of North Carolina. From 1936-1939, Daniels taught English and history in Hertford County, North Carolina. She also served as recreational director for a reform school in Hertford County and was the Hertford County supervisor of adult education. Shortly afterwards, Daniels enlisted in the U.S. Air Force, serving iAir Force until her retirement in 1964. 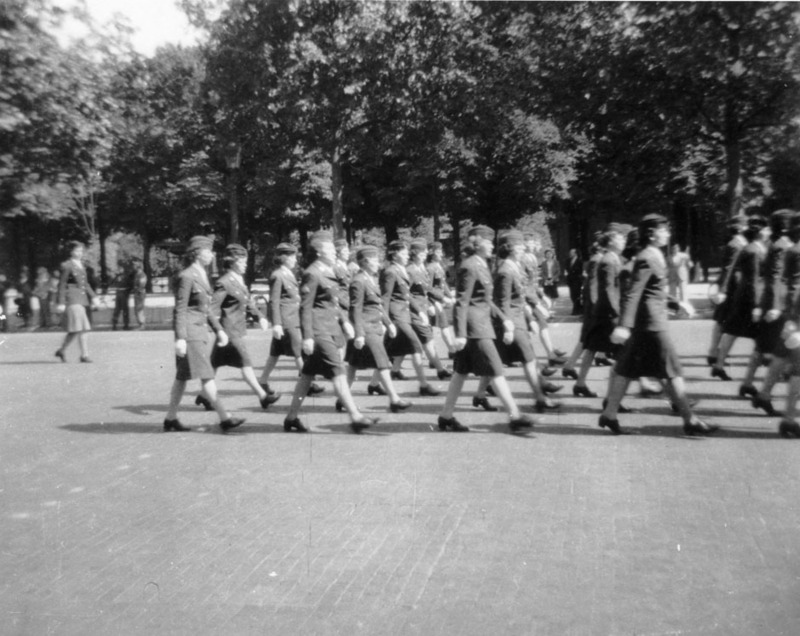 The photograph was taken or collected by Brockie Daniels while she was stationed in Paris. Daniels took photographs of women and men marching or walking through the streets of Paris, coordinating traffic flow and transportation, and sightseeing with her comrades in France. This blog post is one in two-week series of posts sharing the items used in the exhibit titled “The Family Traditions of Service: A Historical Tribute to Veterans.” This exhibit, on display from November 3 to November 13, 2015, at the Dare County Arts Council building in Manteo, N.C., is sponsored by the Friends of the Outer Banks History Center, the exhibit serves as a historical tribute to over 100 years of military service of North Carolina residents and their families, with particular emphasis on coastal North Carolina. The goal of the exhibit is to honor the role of North Carolina veterans and their families during peacetime and war. The items from this exhibit come from the holdings of the Military Collection at the State Archives of North Carolina and the Outer Banks History Center. This entry was posted in Outer Banks History Center and tagged exhibits, Family Traditions of Service, Military Collection, Outer Banks History Center, World War II on November 22, 2015 by Francesca. This photograph comes from the World War II service of Mary “Brockie” Daniles of Manteo, N.C. Mary Brockwell “Brockie” Daniels (1912-2007) was born in Manteo, North Carolina to Edward and Mary Wescott Daniels. She was one of five children. Daniels received her BA in English in 1935 from the Women’s College of the University of North Carolina. From 1936-1939, Daniels taught English and history in Hertford County, North Carolina. She also served as recreational director for a reform school in Hertford County and was the Hertford County supervisor of adult education. Shortly afterwards, Daniels enlisted in the U.S. Air Force, serving in the Women’s Air Corps in both the United states and Europe during World War II. During the war, she was sent to Paris, France, as a member of the 29th Traffic Regulating Group. This group was responsible for controlling and regulating traffic in the Military Railway Service, in Marine Operations, and Motor Transport throughout the European Theatre for the Allied forces. After the war, Daniels remained in the Air Force until her retirement in 1964. 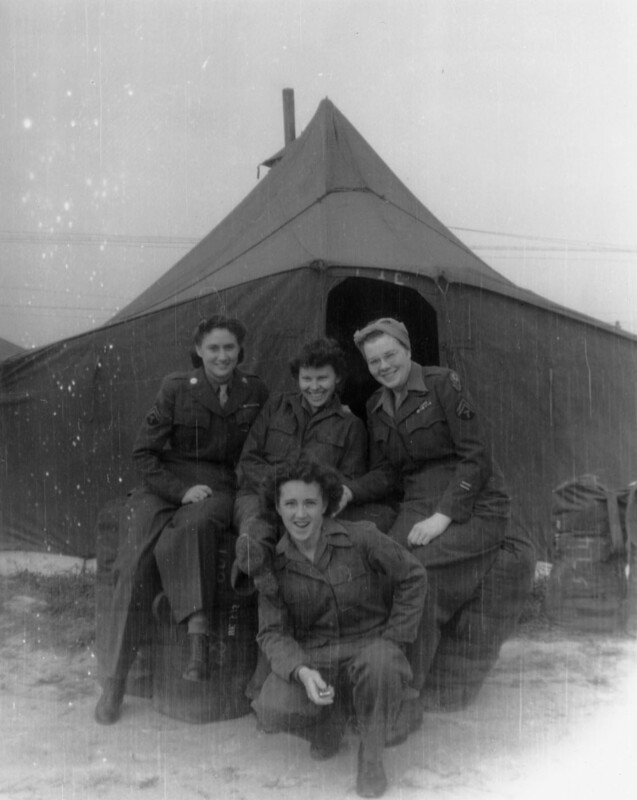 In this image, Mary Brockwell “Brockie” Daniels (foreground) is pictured surrounded by her WAC colleagues outside of their U.S. Army tent on an unidentified beach. In 1848, U.S. federal government funds were committed to limited lifesaving operations along America’s coastline. Volunteers staffed scattered facilities for over twenty years before a professional lifesaving service was created in 1871, as a unit within the U.S. Treasury’s Revenue Marine Bureau. In June 1878, the U.S. Lifesaving Service was made an independent unit of the U.S. Treasury Department. It went on to build an extraordinary history of service and heroism before becoming part of the new U.S. Coast Guard in 1915. Caffey’s Inlet derived its name from George Caffee, who in 1788 purchased a hundred acres of land north of the present village of Duck in Dare County. Not long after the purchase, a small inlet cut through his property. This inlet was known as Caffee’s Inlet at the time (also as Providence Inlet). The site of the Caffey’s Inlet Station was deeded to the U.S. Treasury Department by Hodges Gallup of Dare County in 1874. After falling into disrepair in the late 1890s, a new station at that location was constructed. Following the reorganization of the Lifesaving Service into the U.S. Coast Guard in 1915, Caffey’s Inlet Station continued to serve as a valuable operation for shipping along coastal North Carolina. The station remained functioning throughout World War I and the 1920s. By 1939, the number of shipwrecks and vessels in distress in the station’s region had decreased, and the station was no longer needed. The Coast Guard abandoned Caffey’s Inlet Station in the late 1950s. Pictured here at Caffey’s Inlet Station in the early 1930s are: (left to right) [station] keeper, Truxton Midgett, Aubrey Harris, Walter Beacham, Doc Fulcher, and Melvin Tillet. Credit line: United States Coast Guard and United States Lifesaving Service Portraits Collection, formerly displayed in the Keeper’s Galley Restaurant, Sarah Owens Collection, Outer Banks History Center. This entry was posted in News, Outer Banks History Center and tagged exhibits, Family Traditions of Service, Military Collection, Outer Banks History Center on November 21, 2015 by Francesca. 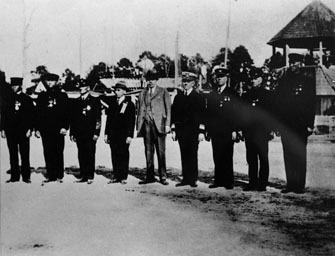 This is the original photograph of the lifesavers of the Chicamacomico Life Boat Station receiving in July of 1930 “Grand Crosses of the American Cross of Honor” gold medals for their heroic rescue in 1918. Pictured here are: (left to right) Surfmen Leroy Midgett, Prochorus O’Neal, and Zion S. Midgett; [two unidentified civilians]; RADM Frederick C. Billard, Commandant of the Coast Guard; Keeper John Allen Midgett Jr.; and, surfmen Arthur Midgett, and Clarence Midgett. Credit line: United States Coast Guard and United States Lifesaving Service Portraits Collection, Sarah Owens Collection, Outer Banks History Center. This entry was posted in News, Outer Banks History Center and tagged events, Family Traditions of Service, Military Collection, Outer Banks History Center on November 21, 2015 by Francesca. The town of Southern Shores was founded as a resort in 1946, and became incorporated as a municipality in 1979. This area of Dare County included portions of the Kitty Hawk Woods and Duck Woods forests. In 1878, the United States Lifesaving Service constructed and commissioned the Paul Gamiel’s Hill Lifesaving Station in the area. It was reconstructed in 1909, and was operated by the U.S. Coast Guard during World War II. 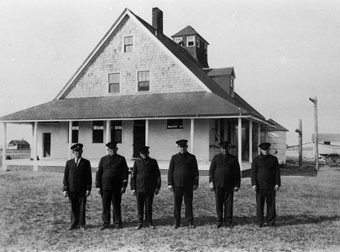 The Coast Guard abandoned the station in 1949, and the building burned down in the 1960s. This photograph speaks to the role of North Carolina families’ military service in coastal operations and rescue services during World War I. In World War I, Coast Guard service individuals responded to distress calls from ships attacked by German submarines along the North Carolina coast. Pictured here at Paul Gamiel’s Hill Station, located between Kitty Hawk and the village of Duck, North Carolina, in 1914 are: (left to right): Capt. Tom Harris, Andrew Scarborough, John Beacham, P. D. Beals, Alfonzo Tillett, Joe Crank (the cook), Rob Sanderlin, Bannister Hines, and Marshall Nelson. This entry was posted in News and tagged exhibits, Family Traditions of Service, Military Collection, Outer Banks History Center on November 20, 2015 by Francesca. This photograph speaks to the early role of North Carolina families’ military service in coastal operations and rescue services prior to World War I. Construction of a lighthouse at Cape Hatteras was first authorized in 1794 when Congress recognized the danger posed to Atlantic shipping. Construction did not start until 1799. The first lighthouse went into operation in October 1803. This li ghthouse was not tall enough to effectively warn ships of the dangerous Diamond Shoals along the North Carolina coast, and in 1853, 60 feet was added to the height of the lighthouse to make it more visible to ships. By the 1860s, Cape Hatteras Lighthouse was in dire need of extensive repairs. Instead of repairing the failing structure, a new lighthouse was opened on December 1, 1870. The 1803 lighthouse was demolished in February 1871. The Cape Hatteras Lighthouse received its black and white stripe day-mark pattern in 1873. 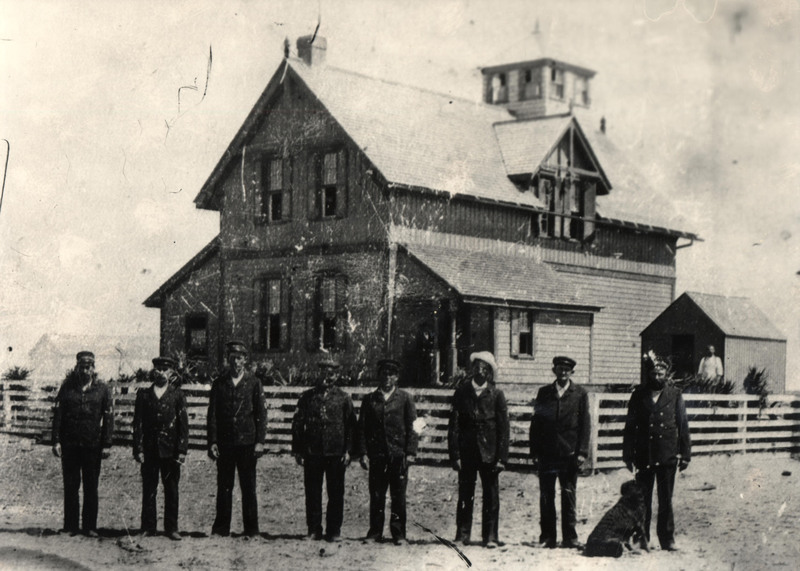 The United States Lifesaving Service established a lifesaving station just one mile south of the Cape Hatteras Lighthouse, near Cape Point, North Carolina, in 1882. 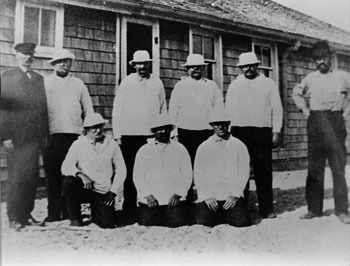 Pictured here around 1900 at the Cape Hatteras Lifesaving Station are: (left to right) Urias Williams, Edward Midgett, Baxter Miller, John Howard Midgett, Issac [should this be Isaac?] Jennette, Ed Stowe, Dave Barnett, their dog Rover, and Keeper Capt. Pat Etheridge. The two men standing on the porch are Dr. Josh J. Davis and Theodore Meekins. In the background in front of the small outbuilding is the cook, Charlie Olsen. This entry was posted in News, Outer Banks History Center and tagged exhibits, Family Traditions of Service, Military Collection, Outer Banks History Center on November 20, 2015 by Francesca. The Cape Lookout Life-Saving Station Teletype Rolls consist of more than 65 original brittle, rolled, brown paper teletype rolls that were found at the U.S. Coast Guard Cape Lookout Life-Saving Station boathouse on Harkers Island, North Carolina. The rolls were created between 1938 and 1945. In 1957, the U.S. Coast Guard sold the Cape Lookout Life-Saving Station boathouse to a family, who discovered these teletype rolls in the boathouse. The rolls had suffered from water, rat and mice chewing, and mold damage. The family donated them to the State Archives in 2010. Teletypewriters or teletype machines are electro-mechanical typewriters that were used to send and receive typed messages over radio signals and telephone landlines among communication stations and ships. In World War II, the U.S. Navy and Coast Guard used these machines for military communication, monitoring potential enemy submarine communications and vessels in distress along the U.S. coastline. Finding this many original mostly intact teletype rolls from WWII is very rare. Usually, teletype operators tore off messages from the roll after a communication was received. This section contains communications among teletype operators along the East Coast about an intercepted SOS distress call for a ship 78 miles off Montauk Point Lighthouse on Long Island, New York City, which was in a collision and required assistance. The teletype operators are trying to verify the legitimacy of the call, fearing it might be a fake distress call from a German submarine setting a trap. The operators share information about authorities forwarding the distress call to the appropriate authorities. This undated roll covers two days from 12:00 A.M. to 8:00 A.M. This roll section contains a phrase repeated throughout all of the teletype rolls: “Now is the time for all good men to come to the aid of their party.” This phrase is from a Patrick Henry quote. In 1867, the phrase was first proposed as a typing drill by instructor Charles E. Weller. The phrase was a typing test for speed and accuracy, which is why it appears in the teletype rolls during teletype operators’ testing their communication systems. The Military Collection is working on an ambitious landmark 3 to 5 year project to preserve the informational content of the teletype rolls through in-house digitization. Digitization is challenging due to the rolls’ length: the shortest teletype roll is 1½ feet, and the longest is 54 feet. The paper the rolls were printed on is very acidic, and was never meant to last. Digitization is the only way to save the information, and will allow the Military Collection to read the rolls’ content. Once the rolls have been digitized in-house, the Military Collection Archivist will try to determine the best means to make them available to the public—either onsite at the State Archives or online. If you or someone you know worked with the radio communications or teletype machines in the 1940s or 1950s, and might be able to help identify the content of the rolls, please contact the Military Collection Archivist at the State Archives of North Carolina. This entry was posted in News and tagged exhibits, Family Traditions of Service, Military Collection, Outer Banks History Center, World War II on November 19, 2015 by Ashley.